… then ScubaTech stands for the place to get your gear – and your guidance. Since 1988, the store has served local and visiting diving and snorkeling enthusiasts for their every educational and equipment need. It’s safe to say these ladies love what they do. 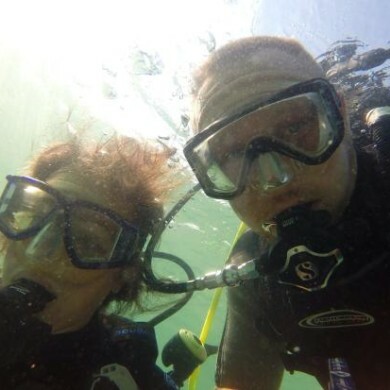 Birchett is a certified Open Water Diver and Instructor who earned her USCG Captain’s License in 1989 and achieved Master SCUBA Diver Trainer status in 1998. Moore, who was certified as an Open Water Diver in 1987 and received her Rescue Diver rating in 1991, also runs the dive store. ScubaTech offers snorkeling and SCUBA classes for locals and tourists who are not certified, in addition to running charter expeditions for certified divers. Those charters take place aboard the “Sea Cobra,” voted the “Best Dive Boat on the Emerald Coast” by readers of Emerald Coast Magazine. She is both quick and comfortable. At 45 feet, she features a spacious deck, tank racks and two giant stride entry points. ScubaTech’s most popular dive charter is a four-hour, two-dive trip to the natural limestone ledges, wrecks and artificial reefs around Destin. Not ready for the deep end? Never fear. ScubaTech’s shaded, 33-foot custom pontoon boat, The Mongoose, has comfortable seating for up to 25 passengers. A shallow drafted vessel, even the most inexperienced snorkeler or diver will be put at ease. ScubaTech provides professional masks, snorkels, fins and vests for your safety. If needed, they can also provide a wetsuit. Snacks, soft drinks and fresh water are available to all passengers. If one charter has you hooked, head into the Dive Store, featuring the finest equipment on the coast. “We sell lots of stuff for diving or snorkeling, and we carry some pretty awesome T-shirt designs,” Moore says. So take a deep breath, and go get your feet wet! To get started, visit ScubaTech online or call (850) 837-2822.